Nashville is the capital city of Tennessee, it’s located on the banks of the Cumberland River, in the north of the state. 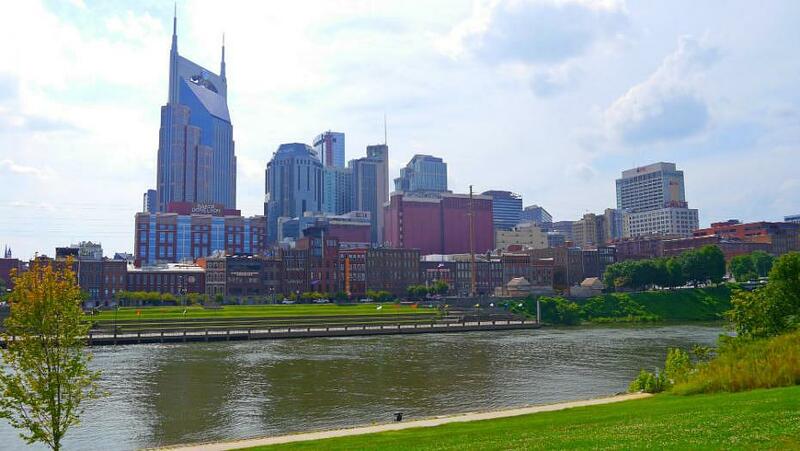 Nashville is the second most populous city in Tennessee and the World Capital of Country Music. Nashville, nicknamed the Athens of the North, is a university town and home to some of the most representative monuments of the American neoclassical architectural movement. The Hermitage and the State Capitol are some of Nashville’s main attractions. Broadway and 2nd Avenue concentrate many restaurants, bars, galleries, night entertainment, and live music venues. Music City Central is the main transport hub in the Tennessee capital. Nashville’s public transport system consists mainly of bus routes. In terms of climate, Nashville generally enjoys moderate winters and hot summers, snowfalls are occasional between January and March. The Tennessee Capital is home to multiple festivals and country music concerts. The city is also home to the famous Country Music Hall of Fame. The best area to stay in Nashville to be close to its main attractions is Downtown (See accommodation in Downtown Nashville). The Music Row District concentrate most of the live music bars and venues. (See accommodation in Music Row). The best hotels to stay in Nashville, Tennessee. Hostels and cheap stays all over Nashville. Would you like independence? 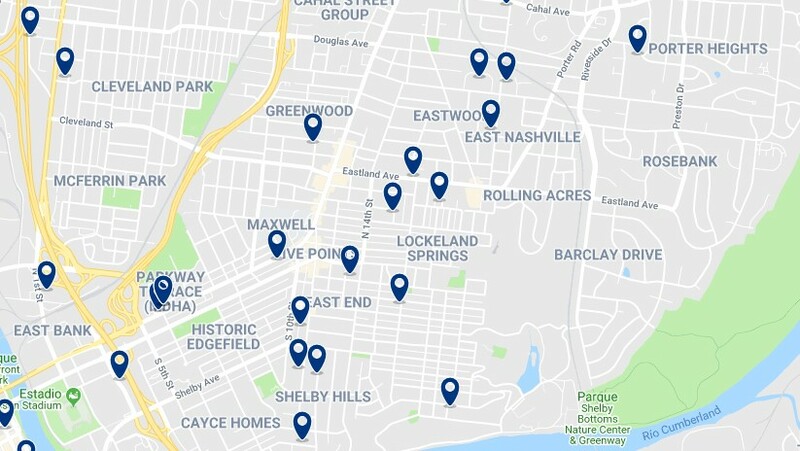 Book an apartment in Nashville. Guest houses, bed and breakfast and pensions in Nashville. Music Row is a small and historic Nashville district, located southwest of the Downtown area. Music Row covers the area from 16th and 17th avenues, called Music Square East and Music Square West, to Demonbreun Street. This area is famous for its many shops, shopping centers, museums, and restaurants, many of which are dedicated to country music and the rich musical culture of the Tennessee capital. Among its most emblematic sites are Owen Bradley Park, Owen Bradley’s Quonset Hut, Scarritt Bennett Center and the famous Historic RCA Studio B. 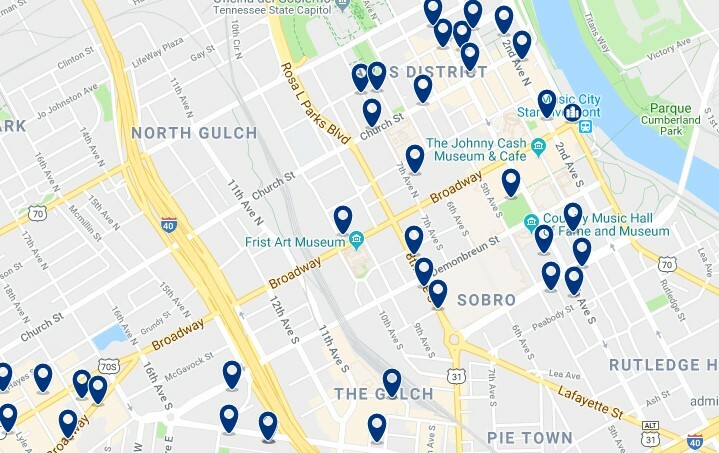 As the center of this district lacks bus stops, in order to use public transportation on Music Row, it is necessary to go to the southern end of the area, to Music Square or 21st Avenue. Music Row has a variety of accommodation options. Especially business-style, and some luxury hotels. Music Row is one of the most attractive and central areas to stay in Nashville. Best Western PLUS Downtown/Music Row serves a daily hot breakfast, has an outdoor pool and is 0.5 mi. west of The Gulch restaurant district. The Ryman Auditorium and the Country Music Hall of Fame are 1 mile away. – from US$124. Downtown Nashville is located west of the Cumberland River, It encompasses the districts of Rolling Mill Hill, Rutledge Hill, Pie Town, The Gulch, North Gulch and part of Hope Gardens. 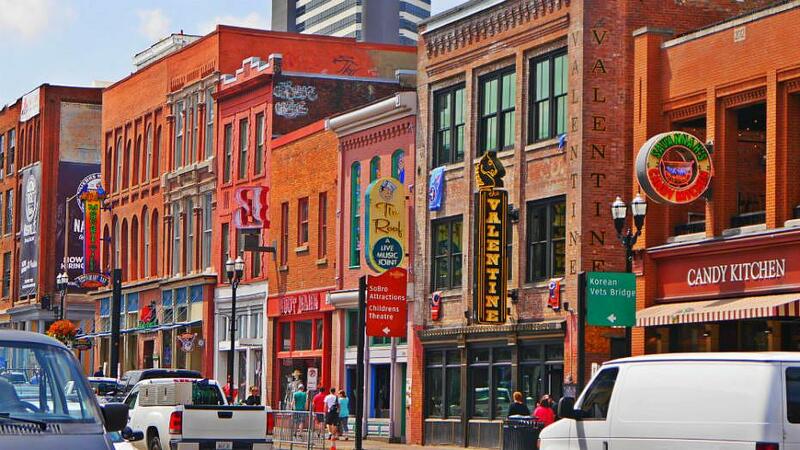 Downtown Nashville concentrates most of the historical and cultural attractions of the city. The Tennessee State Capitol is one of the most important monuments in town. It is located between 5th and 6th streets of the north of Downtown. The southern end of Downtown, concentrates many Nashville museums, most of them related country music, such as the Johnny Cash Museum and the Country Music Hall of Fame. The downtown area of Nashville has the best tourist attractions in the city, making it the best area to stay in Nashville for sightseeing. Moving around the city and reaching more distant sights, such as the Parthenon, is convenient from Downtown. The central public transport station, Music City Central, is located near the Capitol and offers several bus lines. Clarion Hotel Downtown Nashville – Stadium is located in downtown Nashville, one mile from the Bridgestone Arena sports and concert venue. It offers an indoor saltwater pool, free breakfast buffet with hot options and free Wi-Fi. – from US$144. Applause Guest House Located in Nashville, less than a mile away from Vanderbilt University, it offers a shared lounge. The property is one mile from Bridgestone Arena, 18 minutes’ walk from Tootsies Orchid Lounge and an 18-minute walk from Ryman Auditorium. – from US$99. Comfort Inn Downtown Nashville/Vanderbilt is 15 minutes from Grand Ole Opry by car. Facilities include a seasonal outdoor pool, breakfast and rooms with free WiFi. – from US$130. Thompson Nashville is located in The Gulch district of Nashville, Tennessee, it offers contemporary-style rooms with free Wi-Fi and a rooftop bar with panoramic views of downtown Nashville. – from US$224. Nashville’s West End is located in the Midtown district, south of Watkins Park and west of Music Row. This area is very popular among visitors. Centennial Park is its most visited attraction, thanks to its cultural festivals, such as the Tennessee Craft Fair and the Celebrate Nashville Cultural Festival. 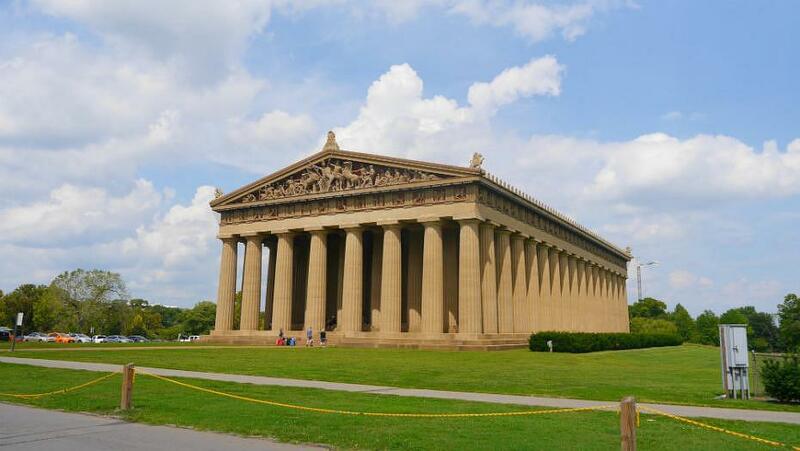 At its western end of the park is the main attraction of the district, the popular Nashville Parthenon. This replica of the Greek temple houses a statue of Athena Parthenos and a couple of art galleries. 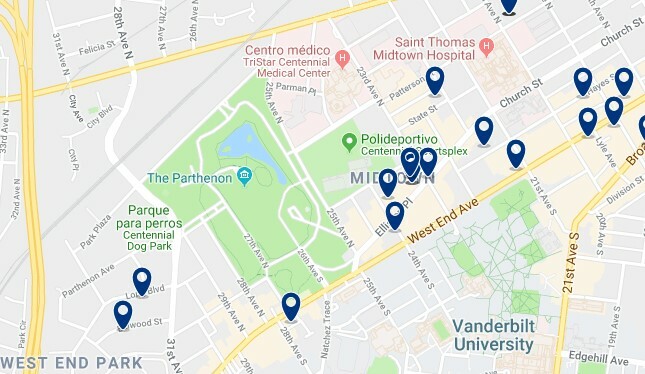 Avenues 31 Street and Charlotte have numerous bus stops near Centennial Park and the Parthenon, from here you can move to any corner of Midtown and other districts in Nashville. Nashville’s West End is the best area to stay in the city to visit the Parthenon and the attractions of Centennial Park. West End abounds with mid-range hotels and well-known local chains. The Hayes Street Hotel offers a bar with live music and is located in downtown Nashville, less than one mile from Vanderbilt University. Free WiFi is available. – from US$154. Extended Stay America – Nashville – Vanderbilt is located next to Vanderbilt University and offers a fully equipped kitchen, free Wi-Fi in all rooms and a 24-hour reception. Tennessee State University is 3 miles away. – from US$79. Holiday Inn Nashville-Vanderbilt is located between Vanderbilt University and Centennial Park and includes a microwave and refrigerator in all rooms. There is free WiFi and an outdoor pool. – from US$144. Loews Vanderbilt Hotel, located 10 minutes’ drive from downtown Nashville and the Country Hall of Fame and Museum, it offers spacious rooms and gourmet-style food. Free WiFi access is available in the entire property. – from US$229. South Nashville is one of the largest districts in the city, located south of downtown and east of Music Row. The city’s fairground complex, called The Fairgrounds Nashville, gives life to the southern area of the city. It is the official seat of the traditional Tennessee State Fair and multiple sporting events. South Nashville also hosts the Wedgewood / Houston neighborhood. Nicknamed WeHo, this amazing area is the hipster and creative neighborhood of Nashville. WeHo offers art galleries on every corner, cool cafes, restaurants and a creative atmosphere. When it comes to public transport, buses connect Bransford Avenue. During the State Fair, the streets around this area tend to get congested, so it is recommended to stay near the fair complex in order to move faster. It is a relatively cheap area to stay in Nashville, quite central and affordable, thanks to its two and three star hotels. 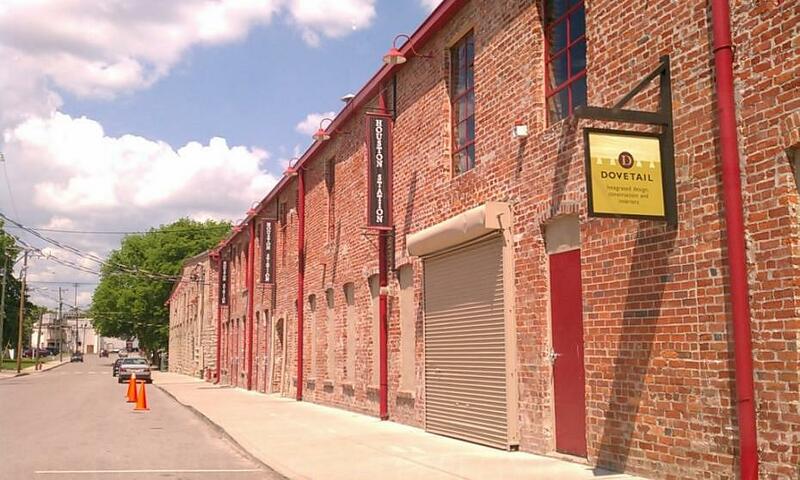 Scottish Inn Nashville offers air-conditioned accommodation and a balcony in Nashville. The apartment is half a mile from Nissan Stadium and a mile from Johnny Cash Museum. – from US$89. East Nashville is (as the name might suggest) to the east of Downtown Nashville, across the Cumberland River. It is a mainly residential area, known for its many parks, quaint neighborhoods and coffee shops. Some of its green areas are Shelby Park, Shelby Bottoms, Cornelia Fort, Air Park, East Park and the newly opened Cumberland Park. Some of this areas’ sights also include the massive Nissan Stadium, located at the southern end of the district, next to Downtown. This area attracts NFL and college football fans. In general terms, East Nashville is a quiet, residential area with a family atmosphere, its proximity to downtown makes it a good neighborhood to to stay in Nashville. Dormigo Modern Apartment offers air-conditioned accommodation with a balcony in Nashville. The apartment is half a mile from Nissan Stadium and a mile from Johnny Cash Museum. – from US$77. Opryland is located in east of the Cumberland River. It is an area far from the city center. 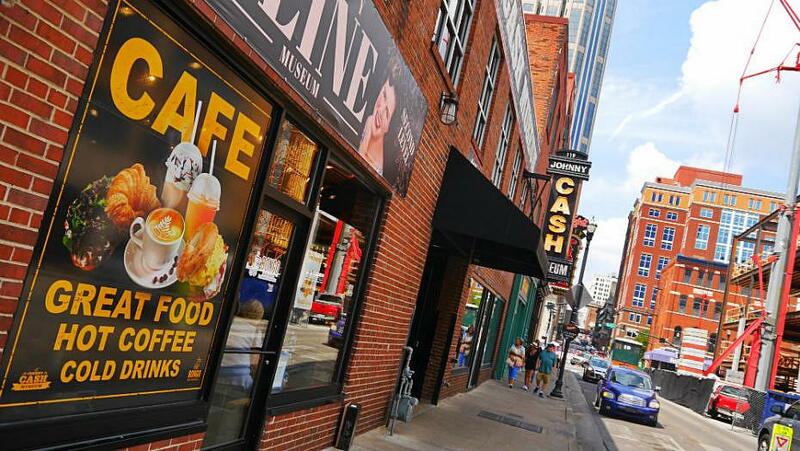 This area is home to Nashville’s most famous shopping and entertainment complex. The largest shopping center in Nashville, Opry Mills, is at the start of Opryland Avenue. Across the street, you can find the Grand Ole Opry concert hall and a few feet away is the Gaylord Opryland Resort and Convention Center. The latter is attractive for its gardens, amphitheaters, a water park, and modern facilities. There are several bus stops on Opry Mills Avenue, which allow you to easily move to central Nashville. Opryland offers mixed accommodation with a variety of costs, within the Convention Center, you can find the most luxurious resort style hotel in the area. Best Western Suites near Opryland is located in Nashville, Tennessee, less than 2 miles from Grand Ole Opry House, it offers an outdoor pool, free continental breakfast and free Wi-Fi. – from US$99. My name is Luis Cicerone. When I was little, I would walk around the house with an atlas in my hand. My rainy Sundays were spent memorising maps and capitals. At fifteen I did my first solo trip and since then I travel whenever I can. I work in travel marketing. I love photography, movies and cat videos.